8mm Forum: Your logistics for showing super 8 features? Author Topic: Your logistics for showing super 8 features? Wondering how people deal with reel changes when showing features for friends or family. Features are typically mounted on 4+ reels. When I screen a multi-reel film, I tend to rewind each one as it finishes but I get some not-unreasonable complaints about the multiple interruptions. Are folks typically splicing these together onto fewer reels? Spool each one onto a different take-up and then rewind them all later, after the fact? Something else? What's your feature-length projector technique? But most of my features are spliced together on one or two reels . I rewind reels on the rewinds I set up by my projector , so I have a minimal of change reel time . I usually don't have any complaints about break - in times . Good Luck with your audiences !! I try to put my features on large spools but when I'm out of them (or when I project 16 mm features mounted on two or three spools), I rewind everything at the end : when the first part of the film is on the take up spool, I use the feeding (if that's the correct term) as taking spool for the second part and so on. I use a combination of largest reels possible and multiple machines, with corrected end-of-reel cues and countdown leaders for my best stab at seamless manual changeovers. In rare cases I can get a feature on one reel, but what about "supporting program" stuff? So my most elaborate shows require 3 projectors so I can go between Super 8 & 16mm. All audio goes into a switch or mixer so it comes out level-matched (as best the source material will allow) to a speaker or two at the screen. Ben, I'd encourage you to find a way to not add interruptions to your presentations that weren't part of the original experience. Thanks everyone. I am using a Bauer projector-- quiet for a small apartment! but only takes up to an 800ft reel (although it's even happier at 600), so reel changes come with the territory. I know many models can do 1200' standard, and I've seen pictures I think of the contraptions that let you spool a huge 2400', e.g. Leon's GS1200-- are those available anywhere predictable? I think I'd have to upgrade the whole kit to Elmo to go that route, but for the time being I like Dominique's suggestion of daisy-chaining the reels to minimize the changeover time and batch rewinding later. For one of my shows, I temporarily took off the head, countdown,and tails from about 15 200ft shorts and reattached them after the show. I found this somewhat labor intensive. Does anyone just leave the heads and tails on their 200ft shorts and splice them all together? Any complaints? I have been doing the same since the 1970s. I believe if you are putting a film show on particularly for others, it has to have a certain pace, which does mean removing the leaders and tails and storing them on the original reels. Although its a bit of work, its what you have to do as "presentation" as best as you can, is what its all about Another thing I used to do, was also to test screen the completed 800/1200ft reels, just to make sure I have the right mix of shorts as well as that certain "pace". I cant think of anything worse, than stopping and starting to kill the interest in film shows. One of the reasons I bought my first ST1200 back in the 70s in the first place, was its 1200ft capacity. Last week I went through a number of 200 footers I have not watched in a long while, due to laziness on my part to make the effort. So it was a matter of sorting them out, to get them in some sort of interesting order, and have since enjoyed screening that 1200ft reel, of those old shorts twice already this week. Its great to be able to just sit back for almost an hour, apart from the odd focus/sound adjustments. Perhaps two projectors would be an ideal solution. simple for us, quite happy to have 1200ft spools max and show most features with one break, (unless its sound of music or gone with the wind, then theirs more breaks), never really been bothered by wanting films on one spool. I also like me cuppa's. We have six projectors between us but never really bothered with all the reel changes etc. Just to keep it all minimal i rewind after any audience has gone. I also make up large reels/spools for shows if they are planned. If I leave the heads and tails on a print I put my hand in front of the lens to block the countdown showing. Normally I remove them and store them in their original boxes. If someone just "shows up" and I show anything I just rewind afterwards....I have plenty of takeups. I don't use the projector to rewind super 8 and the bench is in another room. I do rewind 16mm on the Eiki slot load but I wait until the show is over. Eiki Long-Play unit for my features. My Super-8 feature and b-movie prints are on 1600-2400ft reels, so no interruption, and they rewind on the unit. I always do two machines and keep the films on original reels. I do the best two-handed changeover I can and hope the audience remembers I don't charge admission! This was simple until I built a sound system and I needed to put the mixer in-between, mostly for the old switcheroo. The blu-ray player is yet another story. When it's hooked up it gets a channel on the mixer as well. Claus, do you use this unit to run Super 8? Can these be made to work with most projectors or does it really want an Eiki mated with it? I see the areas of the film where there are opaque light bands of film versus the darker bands (reels). Why does it happen?? Is it subject matter (outdoor filming vs interior filming), chemical formulation, the film itself, etc? The reason I ask is that I spotted this twice while splicing together nearly 50 200ft reels of family films. All of the film was (to the best of my knowledge) Kodak Kodachrome, and I'm just curious as to why this happens. To be honest I am not really sure, I can only guess with your Kodachrome "non stripe" home movies, that its got something to do with the mix of the cellulose film base and how transparent it is at the time of manufacture. I could be completely wrong in this and hope someone here can explain the reasons better. The Eiki Long-Play Unit works fine with 8MM; you use a pair of brass spindle adapters on the thing to make it take the 8mm reels. As long as your projector is of a design with arms on top, the Eiki will play along. I have used it with my Elmo 1200, my Eiki Xenon and SSL. For Super-8 I use a wooden board with an arm that holds the Eiki roller above and in front of the Elmo (for feeding the film); for 16MM, that same roller just sits on the front arm of the Eiki. Claus.....haven't you also used it with a Bolex M8? I seem to recall a picture of that if I'm not mistaken. Yes I have. Works on that too. I just found the picture in the thread "best looking projector" from 2009! Ben, thank you, but don't be TOO impressed: my setup is always in flux and is cobbled together from whatever I have on hand that best fits the need of the moment. Perhaps a second Bauer could be in your future? Favorites searches on eBay are quite helpful! Of course, so is having a few extra Bills in the wallet, if such a thing exists in the real world. Graham asked a great question. Now, after spending all that time to make sure countdown leaders and end cues are spaced correctly, I'd have a hard time going Graham's route and cutting off all those leaders. But what about minimizing load-ups and temp-splicing as many shorts as will fit, leaders intact, and then switching between an "A" and a "B" machine for each subject? See, there's another advantage of two projectors. And it minimizes load-up times and associated risks. I like the idea of splicing with leaders and tails intact and using two machines. I'm going to use that some time! I often do a show of four or five shorts and rewind the dark machine in between. It gets a little tense when you have let's say a hundred foot film on screen and you have to do a rewind in the dark. That slot on the supply reel just doesn't want to hold the tail sometimes! As I said: my standard setup is two machines. One of the things I like about it is it spreads the work out among at least two. -what is a little worrying about it is if someday a print comes up damaged, it'll be pretty hard the identify a suspect. 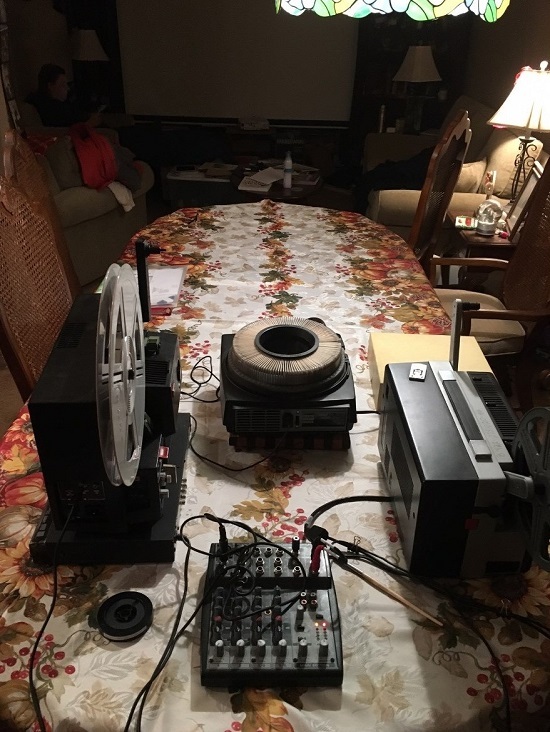 I just always have an extra 600ft reel, so that when go reel to reel, I'm able to watch the whole thing all the way through and then rewind it at the end, as that is "discussion time" about the film! Steve Klare, I love the slide projector in between the two projectors! Some say I should just transfer the slides to digital, but this was my Dad's! Not very long ago, on another dining room table not too far away, we also used to share a screen. When we sold my parent's house last year I wound up being the keeper of the slides. I recently bought a carousel full of slides that once were used in a commercial movie theater. Of course, by the third time you go through, the trivia quizzes aren't much of a head-scratcher anymore!